Cooler Master har utannonserat sitt nya flaggskeppschassi: Cosmos C700M. 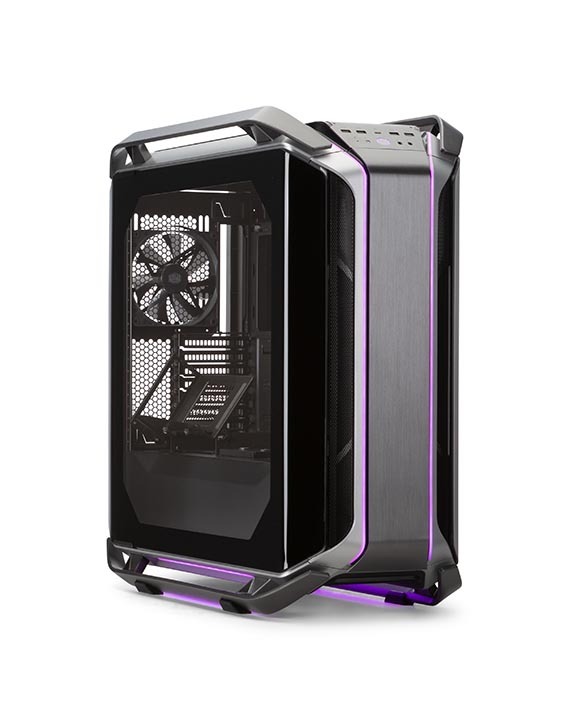 Cooler Master lanserar COSMOS C700M, det senaste tillskottet till COSMOS serien. Denna gång höjer de den ökända ribban, genom att enligt de själva driva på vad gränserna för chassiteknik, design och funktionalitet – i detta nya chassi. Denna gång så ökar de på med modulariten och möjligheten att anpassa chassit inför exempelvis turneringar. Sedan är även själva designen enligt Cooler Master mer mångsidig – att du nu kan använda betydligt mer av ytan inuti chassit. Detta tillsammans med ARGB belysning, mer avancerat kabelsystem, och kurvade glassidopaneler, gör att denna nya säkerligen komma finna sina fans. Dock är det inte en billig historia – då listpriset i nuläget är satt till att vara 439.99 euro. shroud, then a reservoir and/or SSDs can be mounted. same size and thread type so builders do not have to worry about which screw goes where. Highly Versatile Layout – The unique frame design supports a conventional, chimney, inverse layout, or afully customized layout. The motherboard tray is also removable for installation outside of the chassis. Graphics Card Mounting with Riser Cable – The graphics card bracket can be mounted vertically orhorizontally on either the PSU midplate or on the M. Port. The bracket can also be rotated from 0 to 90degrees. Also included is a 400mm riser cable for the convenience of being able to connect a verticallymounted graphics card to the motherboard. ARGB Lighting – Two parallel strips of addressable RGB lighting run continuously from the top panel to thefront panel, with ambient ARGB lighting on the bottom that reflects against the aluminum bars. Extensive Cable Cover System – The 3 included covers can be placed on either the M. Port or on the mid-plate, with the ability to mount SSD storage or a reservoir for liquid cooling support. Versatile Liquid Cooling Support – A flat radiator bracket design offers more versatility for liquid cooling withthe ability to be mounted on the top, front, or bottom of the frame. The two included brackets can each supporta 420mm radiator, with the ability to mount fans and a radiator on either side of the bracket. Aluminum Panels & Handles – Brushed aluminum spans the top panel and front panel, with cast aluminumhandles (and feet) that provide protection & support for carrying the case. Curved Tempered Glass Side Panel – A panoramic tempered glass side panel, with two curved edges, offera wide view of the system build. Lighter in comparison to the COSMOS C700P, this panel is also backwardscompatible. Rich Connectivity – The advanced I/O panel comes with a 4-Pole headset jack, a standard 3-Pole mic jack,USB 3.1 (Gen 2) Type-C port, four additional USB 3.0 ports, PWM fan speed button, and an addressable RGBcontrol button.